Autoridades presentes, prezados colegas, estimados alunos, Boa tarde! Novamente nos reunimos para aprofundar nossos conhecimentos. Nesta VI Jornada de Farmácia, foi este o nosso norte: tornar as práticas profissionais do campo farmacêutico mais próximas de nossa comunidade acadêmica. Para nortear nosso programa, fomos até nossa “audiência” e buscamos atender aos anseios dos alunos, aquilo que pensavam ser de maior importância, ou para temas que fossem de maior interesse. Buscamos inovar também no formato do evento: nesta edição, priorizamos oficinas teórico-práticas, buscando profissionais renomados nos diversos campos de atuação, para que estes, além de falar sobre suas práticas, também pudessem demonstrar a rotina de suas atividades – nem sempre tão rotineiras. A diversificação de temas presentes no evento reflete a gama de campos de atuação possíveis para os profissionais farmacêuticos, e nos orgulha, como profissionais que somos, de poder contribuir de tantas maneiras diferentes para o desenvolvimento da sociedade. Com os avanços tecnológicos, sociais e culturais crescem ainda em maior proporção as necessidades de atualização, o que torna a atuação do profissional um desafio constante. Porém, a busca pela competitividade tem aberto espaço para questões éticas e humanísticas, e, estas, permeiam a atuação do farmacêutico. Posso dizer com orgulho que tanto a tecnologia quanto a humanização e o cuidado farmacêutico tem espaço neste evento. A organização de um evento nunca é uma tarefa trivial. Os últimos meses foram de muito trabalho para que pudéssemos estar reunidos aqui hoje. Agradeço a presença constante da comissão organizadora desta VI Jornada de Farmácia, que disponibilizou seu tempo, suas experiências, seu bom humor, seu bom senso, sua boa vontade e seu companheirismo em todas as etapas dos preparativos. Gostaria de estender meus agradecimentos à Caixa Econômica Fedral, patrocinadora do evento, bem como as empresas apoiadoras: Reni farmácias, Farmácia Via Exata e Vinícola Velho Amâncio. Espero que este evento traga, a todos os que dele fizeram e farão parte, uma oportunidade de debate e de capacitação profissional, um sentimento de dever cumprido, uma vontade de fazer mais e melhor! Que desperte a consciência tanto do que conhecemos, quanto do que temos a conhecer! Gostaria de encerrar citando uma frase que gosto muito, de autor desconhecido: Na procura de conhecimentos, o primeiro passo é o silêncio, o segundo ouvir, o terceiro relembrar, o quarto praticar e o quinto ensinar aos outros. Declaro aberta a VI Jornada de Farmácia. Metformin is one of the oldest oral treatments to reduce hyperglycaemia in people with diabetes. Gastrointestinal side effects are common, and metformin should be used with caution in patients with renal impairment because of the slight risk of lactic acidosis. In the United Kingdom Prospective Diabetes Study (UKPDS) patients treated with metformin had a significant reduction in myocardial infarction and mortality that was not demonstrated in patients treated with sulphonylureas or insulin. The fact that metformin significantly reduces cardiovascular events plus reduces weight has meant that metformin is the drug of first choice in guidelines for the treatment of type 2 diabetes. There are no longer concerns about using metformin in patients with chronic heart failure, other than in patients with associated renal failure, or during episodes of acute left ventricular failure when metformin should be temporarily stopped. The prevalence of type 2 diabetes mellitus (T2DM) is reaching epidemic proportions. Metformin therapy has been used in the treatment of T2DM for many years. Despite an increased armoury of agents for treating hyperglycaemia, only metformin has been shown to improve prognosis as a primary end point in a randomised-controlled trial. Clinical studies have shown that the effects of metformin go beyond improving glycosylated haemoglobin (HbA1c) and include reductions in cardiovascular end points. Despite the evidence base for the benefits of metformin, concerns remain about its side effects, including the perceived risk of lactic acidosis, particularly in the presence of cardiac and renal failure. Evidence confirming its safety, even in the setting of cardiac and renal failure, has resulted in metformin being accepted globally as the first-line treatment for overweight patients (body mass index [BMI] >25 kg/m2) with T2DM. The proposed mechanisms of action of metformin, which are not fully understood, are illustrated in figure 1. It can lower blood glucose in several ways. It acts by countering insulin resistance, particularly in liver and skeletal muscle. It suppresses hepatic gluconeogenesis, increases peripheral insulin sensitivity in insulin sensitive tissues such as muscle and adipose tissue, and enhances peripheral glucose utilisation. The protective effect on the cardiovascular system cannot be fully explained by its blood glucose-lowering properties. These effects may be partly mediated via beneficial effects on circulating markers of endothelial function (vascular cell adhesion molecule-1 [VCAM-1], E-selectin), fibrinolysis (plasminogen activator inhibitor-1 [PAI-1]) and chronic inflammation (C-reactive protein [CRP]). There are several other potential mechanisms postulated to explain the cardiovascular benefits beyond blood glucose lowering, including disruption of respiratory chain oxidation in mitochondria and activation of the enzyme adenosine monophosphate (AMP)-activated protein kinase (AMPK). [2,3] AMPK is a protein kinase ubiquitously expressed in mammalian tissues and involved in regulating energy balance. Activation of AMPK stimulates adenosine triphosphate (ATP)-producing catabolic pathways, while inhibiting ATP-consuming anabolic pathways, thereby, maintaining cellular energy stores. In skeletal muscle, activation of AMPK increases glucose uptake and lipid oxidation. In liver, activation of AMPK inhibits gluconeogenesis and lipid synthesis but increases lipid oxidation. 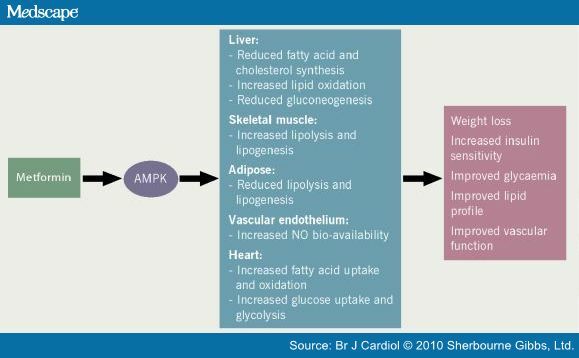 Finally, in adipose tissue, activation of AMPK reduces both lipolysis and lipogenesis. Therefore, activation of AMPK in skeletal muscle, liver and adipose tissue results in decreased circulating glucose, lipids and ectopic fat accumulation, as well as enhanced insulin sensitivity. Metformin has a short half-life of around six hours and undergoes renal excretion with 90% being eliminated within 24 hours. It can be prescribed as 500 mg or 850 mg tablets. It should be started at the 500 mg dose and increased in weekly increments until the maximum tolerated dose is achieved, normally 2 g/day. It should be taken with food to reduce the potential for gastrointestinal side effects. Occasionally higher doses are given depending on clinical response and tolerability. Hypoglycaemia is not usually a side effect of metformin therapy and it tends not to result in significant weight gain. The main side effect of concern is its association with lactic acidosis particularly in the setting of renal and cardiac failure. Metformin is licensed to be given on its own in patients who have failed to improve with dietary modifications or it can be given in combination with sulphonylureas, thiazolidinediones, repaglinide/nateglinide, dipeptidyl peptidase-4 (DPP4) inhibitors (sitipliptin, vildagliptin, saxagliptin), glucagon-like peptide-1 (GLP-1) agonists (exenatide or liraglutide), acarbose or insulin. Indeed, given that the benefits of metformin are considered to go beyond glycaemic control, all overweight patients with T2DM should be on metformin, if tolerated. There is limited evidence to support the use of a slow-release preparation of metformin (Glucophage SR®) on the basis of fewer gastrointestinal side effects. The United Kingdom Prospective Diabetes Study (UKPDS) study, initiated in 1977 and reported in 1998, demonstrated that improved glycaemic control was associated with a reduced incidence of microvascular complications (such as nephropathy and retinopathy). While no significant effect of lowering blood glucose was observed on cardiovascular complications, epidemiological analysis of the UKPDS data has demonstrated a continuous association between the risk of cardiovascular complications and glycaemic control. Metformin has been shown to improve glycaemic control compared with placebo or diet. When compared with placebo, metformin shows improvement in HbA1c and fasting plasma glucose, but there are no significant differences for BMI or weight, total cholesterol, high-density lipoprotein (HDL)-cholesterol, low-density lipoprotein (LDL)-cholesterol, triglycerides, or blood pressure. When compared with diet, metformin shows improvement in HbA1c and total cholesterol, but no difference for fasting plasma glucose, BMI or weight, HDL-cholesterol, LDL-cholesterol, triglycerides, or blood pressure. Metformin and sulphonylureas have similar effects on HbA1c, and there is no significant difference in HbA1c between those using metformin and those using insulin. UKPDS was the first randomised trial to demonstrate improved outcome with metformin treatment. The UKPDS trial allocated patients to either conventional (initial dietary modification with addition of a sulphonylurea for fasting plasma glucose >15 mmol/L) or a more intensive glycaemic control strategy (which could include metformin, sulphonylurea or insulin therapy). Within the UKPDS cohort there was a substudy looking at overweight patients (54% with obesity). Those allocated to metformin (n=342) had improved outcomes compared with those on conventional treatment (n=411). Randomisation to metformin was associated with dramatic relative risk reductions in diabetes-related death (–42%), myocardial infarction (–39%), stroke (–42%) any diabetes-related end point (–32%) and all-cause mortality (–36%) when compared with diet. This is in contrast to the relative risk reductions with sulphonylurea or insulin in diabetes-related death (–20%), myocardial infarction (–21%), stroke (‘14%) any diabetes-related end point (–7%) and all-cause mortality (–8%) when compared with diet. There were no significant differences between metformin and other comparison arms for other outcomes such as stroke, peripheral arterial disease and microvascular disease. Mean HbA1c after follow-up in the diet group and metformin group were 8% and 7.4%, respectively, and there was no clear difference in the glucose-lowering effect between metformin, sulphonylurea and insulin. Given that the glucose-lowering effects of metformin, sulphonylurea and insulin were similar, it has been proposed that metformin must confer additional vascular benefits beyond those of glycaemia alone. The UKPDS Post-Trial monitoring results suggest a legacy effect with continuing benefit of metformin therapy. There is maintenance of the relative risk reductions for any diabetes-related end point (–21%), myocardial infarction (–33%) and all-cause mortality (–27%), despite loss of within-trial blood glucose and therapy differences. Clinical studies in T2DM have shown that the effects of metformin go beyond improving HbA1c and include reductions in cardiovascular end points. Metformin is considered to be the first drug of choice for the treatment of T2DM in overweight patients. There is increasing evidence to show that in the absence of tissue hypoxia and/or moderate-to-severe renal impairment, metformin will not result in lactic acidosis. Importantly, metformin should no longer be contraindicated in patients with chronic stable heart failure and may even have morbidity and mortality benefits. There is a clear need for prospective randomised-controlled studies of metformin therapy in patients with T2DM and the traditional contraindications of heart and renal failure. In the meantime, a pragmatic approach is recommended including temporarily stopping metformin during an acute illness where tissue hypoxia is suspected, which will include patients with an acute myocardial infarction, acute left ventricular failure or septicaemia, or when an individual is due to get radiological investigations using iodine-based contrast medium. Particular care should be taken in patients with chronic renal failure with a lower clinical threshold to temporarily discontinue in the aforementioned circumstances. However, chronic renal failure in itself is not an absolute contraindication to metformin use when the decision to prescribe or not is based on the potential prognostic benefits weighed against the likelihood of harm. UK Prospective Diabetes Study (UKPDS) Group. Effect of intensive blood-glucose control with metformin on complications in overweight patients with type 2 diabetes (UKPDS 34). Lancet 1998;352:854–65. Owen MR, Doran E, Halestrap AP. Evidence that metformin exerts its anti-diabetic effects through inhibition of complex 1 of the mitochondrial respiratory chain. Biochem J 2000;348:607–14. Zhou G, Myers R, Li Y et al. Role of AMP-activated protein kinase in mechanism of metformin action. J Clin Invest 2001;108:1167–74. Saenz A, Fernandez-Esteban I, Mataix A, Ausejo M, Roque M, Moher D. Metformin monotherapy for type 2 diabetes mellitus. Cochrane Database Syst Rev 2005;(3):CD002966. Holman RR, Paul SK, Bethel MA, Matthews DR, Neil HA. 10-year follow-up of intensive glucose control in type 2 diabetes (UKPDS 80). N Engl J Med 2008;359:1577–89. Emslie-Smith AM, Boyle DI, Evans JM, Sullivan F, Morris AD. Contraindications to metformin therapy in patients with type 2 diabetes—a population-based study of adherence to prescribing guidelines. Diabet Med 2001;18:483–8. Cusi K, Consoli A, DeFronzo RA. Metabolic effects of metformin on glucose and lactate metabolism in non insulin-dependent diabetes mellitus. J Clin Endocrinol Metabol 1996;81:4059–67. Eurich DT, McAlister FA, Blackburn DFet al. Benefits and harms of antidiabetic agents in patients with diabetes and heart failure: systematic review. BMJ 2007;335:497–501. Preeclampsia and IUGR are important causes of maternal and perinatal mortality and morbidity. Preeclampsia affects 2% to 5% of pregnancies, leading to more than 100,000 maternal deaths worldwide each year. Previous studies have indicated a risk reduction of 20% for preeclampsia with low-dose aspirin started any time during pregnancy. This is a systematic review and meta-analysis of studies examining the use of low-dose aspirin, started at 16 weeks or earlier or later than 16 weeks of gestation, on maternal and neonatal outcomes of preeclampsia or IUGR and other neonatal outcomes in women at risk for preeclampsia. Included were prospective randomized controlled trials extracted from EMBASE, PubMed, and the Cochrane Central Register of Controlled Trials from 1965 to 2008, which examined the effect of low-dose aspirin on pregnant women at risk for preeclampsia. Excluded were quasi-randomized trials or studies in which 20% or more women were lost to follow-up. Women in the treatment group had to be treated with low-dose aspirin (50 – 150 mg daily, alone or in combination with dipyridamole < 300 mg). The control group had to be allocated to placebo or to no treatment. The primary outcome was the occurrence of preeclampsia. Secondary outcomes included IUGR, severe preeclampsia, gestational hypertension, placental abruption, preterm birth, low birth weight, and gestational age at delivery. Outcomes were stratified by gestational age at which aspirin was started: 16 weeks of gestation or less or more than 16 weeks of gestation. Of 773 articles initially identified, 34 were selected for analysis, including 27 articles for the primary outcome of preeclampsia. 12 studies had women starting aspirin at 16 weeks of gestation or earlier, and 22 studies reported data on women starting aspirin after 16 weeks of gestation. Risk for preeclampsia was defined in different ways, including nulliparity and a history of preeclampsia or other hypertensive disorders. Women who began aspirin at 16 weeks of gestation or less had a significantly reduced risk for preeclampsia (RR, 0.47; prevalence 9.3% vs 21.3% in the control group). They also had a significantly reduced risk for IUGR as defined by the various meta-analysis studies (RR, 0.44; prevalence 7% vs 16.3% in the control group). Low-dose aspirin started at 16 weeks of gestation or earlier was also associated with a reduction in severe preeclampsia (RR, 0.09; prevalence 0.7% vs 15.0% in the control group), gestational hypertension (RR, 0.62; prevalence 16.7% vs 29.7% in the control group), and preterm birth (RR, 0.22; prevalence 3.5% vs 16.9% in the control group). All studies involving starting aspirin at 16 weeks of gestation or earlier included women at moderate or high risk for preeclampsia. The birth weight increase in women starting aspirin at 16 weeks of gestation or earlier was 196 g vs 70 g in women starting aspirin later than 16 weeks. The rate of preterm birth was lower for aspirin started earlier than 16 weeks (weighted mean difference, 1.4 weeks). Starting low-dose aspirin later than 16 weeks of gestation was not associated with a significant reduction in preeclampsia, IUGR, preterm birth, or gestational hypertension. The authors concluded that low-dose aspirin started at 16 weeks of gestation or earlier, but not started at later than 16 weeks, was associated with improved maternal and neonatal outcomes in women at risk for preeclampsia. Low-dose aspirin started at 16 weeks of gestation or earlier in women at risk for preeclampsia is associated with a reduction in the risk for preeclampsia, IUGR, preterm birth, low birth weight, and gestational hypertension. O que posso fazer para apaziguar clientes zangados? 1. Não se deixe enganar. Não se irrite quando estiver respondendo. 2. Mantenha-se focado no problema central, e não fale ou compare o caso com os seus próprios problemas. 3. Dizer às pessoas para se acalmar só piora o problema. Uma vez que o cliente começa a se acalmar, você terá a oportunidade de responder, reconhecer a falha e dizer que sente muito. Peça para obter detalhes adicionais ou sugestões para uma resolução aceitável do problema. Certifique-se de manter uma atitude positiva. Mostre ao cliente que você está com a intenção de resolver o problema. Descreva quais são as ações que você vai tomar e siga com seus compromissos. Agradeça ao cliente e incentive-o a informar sobre outras questões possam surgir no futuro. Os recursos listados abaixo descrevem ferramentas adicionais ao cliente de serviços e técnicas. •	CLARK PA, MALONE MP. Making it Right: Healthcare Service Recovery Tools, Techniques, and Best Practices. Marblehead, MA:HCPro, Inc.; 2005. •	BAKER SK, BANK L. I’m Sorry to Hear That: Real Life Responses to Patients’ 101 Most Common Complaints About Health Care. Gulf Breeze, FL:Fire Starter Publishing; 2008. •	DIERING SL. Love Your Patients! Improving Patient Satisfaction with Essential Behaviors that Enrich the Lives of Patients and Professionals. Nevada City, CA: Blue Dolphin Publishing; 2004. •	PATTERSON K, GRENNY J, MCMILLAN R, SWITZLER A, COVEY SR. Crucial Confrontations: Tools for Resolving Broken Promises,Violated Expectations, and Bad Behavior. New York, NY: McGraw-Hill; 2005.